We examined the formation, participation, and functional specialization of virus-reactive Foxp3+ regulatory T cells (Tregs) in a mouse model of influenza virus infection. “Natural” Tregs generated intrathymically, based on interactions with a self-peptide, proliferated in response to a homologous viral Ag in the lungs and, to a lesser extent, in the lung-draining mediastinal lymph nodes (medLNs) of virus-infected mice. In contrast, conventional CD4+ T cells with identical TCR specificity underwent little or no conversion to become “adaptive” Tregs. The virus-reactive Tregs in the medLNs and the lungs of infected mice upregulated a variety of molecules associated with Treg activation, as well as acquired expression of molecules (T-bet, Blimp-1, and IL-10) that confer functional specialization to Tregs. Notably, however, the phenotypes of the T-bet+ Tregs obtained from these sites were distinct, because Tregs isolated from the lungs expressed significantly higher levels of T-bet, Blimp-1, and IL-10 than did Tregs from the medLNs. Adoptive transfer of Ag-reactive Tregs led to decreased proliferation of antiviral CD4+ and CD8+ effector T cells in the lungs of infected hosts, whereas depletion of Tregs had a reciprocal effect. These studies demonstrate that thymically generated Tregs can become activated by a pathogen-derived peptide and acquire discrete T-bet+ Treg phenotypes while participating in and modulating an antiviral immune response. Regulatory T cells (Tregs) expressing Foxp3 are a subset of CD4+ T cells with a unique ability to exert dominant suppression of adaptive immune responses (1, 2). The clearest manifestation of their activity in vivo is the severe lymphoproliferative inflammatory disease that develops in mice and humans who lack Foxp3 expression; because they are required to control a latent autoaggression that exists in the normal immune repertoire, much attention has focused on the ability of Foxp3+ Tregs to control immune responses to self-Ags (3). However, Tregs also participate in immune responses to pathogens, where they can modulate how the immune system reacts to the pathogen itself, and they may also play a role in limiting immune-mediated damage to the infected host’s own cells and tissues (4). There are two main sources of Foxp3+ Tregs that can participate in antipathogen immune responses (5). Thymically generated Foxp3+ Tregs (termed “natural” Tregs) appear to make up the bulk of the peripheral Tregs that are present in naive mice and are generated based on their specificity for self-peptides (6, 7). This bias toward self-reactivity may play an important role in directing the activity of Tregs toward tissue-specific Ags in the periphery, and it may allow Tregs to recognize self-peptides expressed by cells in the infected site. However, it is also possible that Tregs that were formed in response to self-peptides can become activated by recognizing virus-derived peptides with which they can cross-react. A second possible source of Tregs at infection sites is “adaptive” Foxp3+ Tregs that can develop from conventional CD4+ T cells in response to signals such as TGF-β and retinoic acid (8, 9). Inasmuch as CD4+ T cells with identical TCR specificity can be induced to become either adaptive Tregs or differentiated cytokine-secreting effector cells (e.g., Th1 cells) in response to different cytokines (e.g., TGF-β versus IL-12), it has been thought that the formation of adaptive Tregs from conventional CD4+ T cells may be a typical source of Foxp3+ T cells during immune responses (10). However, the extent to which this process actually occurs during infections remains poorly understood and in one infectious setting appeared not to occur (11). Recently, it has become apparent that Foxp3+ Tregs themselves can differentiate to acquire new properties and phenotypes during the course of an immune response (12). This process has been termed “functional specialization”; interestingly, transcription factors that were shown to play important roles in promoting effector T cell differentiation appear to be used by Foxp3+ Tregs to acquire phenotypes that are specialized to control the corresponding effector T cell function. For example, T-bet plays a major role in promoting the development of a Th1 effector phenotype during an infection and directly influences the production of IFN-γ by both CD4+ and CD8+ T cells (13, 14). Foxp3+ Tregs were shown to respond to IFN-γ by upregulating T-bet, which, in this case, induces expression of a homing receptor (CXCR3) and a cytokine (IL-10) that confer on these T-bet+ Tregs the ability to migrate to sites of Th1-mediated inflammation and inhibit Th1 effector cell activity (15). Similarly, mice in which Foxp3+ Tregs selectively lack expression of transcription factors associated with the development of Th2 or Th17 effector cell phenotypes spontaneously develop diseases associated with the corresponding Th2 or Th17 cell hyperactivity (16, 17). However, the extent to which Foxp3+ Tregs typically undergo this kind of functional specialization during an infection is not understood and whether Tregs might be able to adopt distinct phenotypes while responding to a pathogen has not been described. We examined these questions in a mouse model of influenza virus infection using transgenic mice with which the role of TCR specificity for self- and/or viral peptides in Foxp3+ Treg formation can be addressed and in which the fate of virus-activated Tregs in infection can be followed. We show that Foxp3+ Tregs that were generated intrathymically in response to a self-peptide derived from the influenza virus hemagglutinin (HA) proliferate and differentiate into T-bet+ Tregs in response to the viral HA in influenza virus–infected mice. Moreover, the phenotypes that these T-bet+ Tregs display in the infected lungs versus the lung-draining mediastinal lymph nodes (medLNs) are distinct, providing evidence for the formation of discrete subsets of virus-reactive T-bet+ Tregs in an infected host. TS1 and HA28 mice were described previously and are on a BALB/c background (7). BALB/c.Foxp3eGFP mice (18) were obtained from The Jackson Laboratory. Mice were intermated to produce TS1.Foxp3eGFP and TS1×HA28.Foxp3eGFP mice. All mice were maintained in specific pathogen–free facilities under protocols approved by the Wistar Institutional Animal Care and Use Committee. Influenza virus PR8 (A/Puerto Rico/8/1934 [H1N1]) and the reassortant influenza virus J1 (H3N1) (19) were propagated in 10-d hen’s embryonated eggs. For infection, mice were anesthetized with ketamine/xylazine, and 50 μl (200 TCID50) virus was administered intranasally. 6.5+CD4+CD25+Foxp3eGFP+ cells or 6.5+CD4+CD25−Foxp3eGFP− cells were obtained from freshly isolated lymph nodes (LNs) and spleens from TS1×HA28.Foxp3eGFP and TS1.Foxp3eGFP mice, respectively, by staining with anti-CD4, anti-CD25, and 6.5-biotin (20). GFP fluorescence was also used for detection of Foxp3+ cells, and cells were FACS sorted using a high-speed MoFlo XDP cell sorter (Beckman Coulter) and adoptively transferred into mice (106 cells in 100 μl/mouse) by tail vein injection. Spleen, peripheral LNs (pLNs), medLNs, lung, and bronchoalveolar lavage (BAL) cells were collected from infected mice by tissue homogenization, followed by resuspension in FACS buffer (PBS, 2% FBS). Lungs were first perfused by injecting 3 ml PBS in the right ventricle of the heart, and lung tissue was incubated in complete DMEM media supplemented with collagenase D (700 U/lung) and DNase I (350 U/lung; both from Roche Diagnostic) for 1 h at 37°C before generation of a single-cell suspension. A combination of PMA (50 μg/ml), ionomycin (1 μM), and brefeldin A (1×; eBioscience) was used for ex vivo stimulation of cells for 5 h at 37°C. Intracellular cytokine staining was performed according to the instructions in the eBioscience kit, and all Abs were purchased from BD Biosciences or eBioscience. Allophycocyanin-conjugated H2-Kd:NP147 tetramer was directly added to the primary Ab dilution, and cells were incubated for 30 min at 4°C. Stained cell samples were analyzed using a LSR II flow cytometer (BD Bioscience), and collected data were analyzed with FlowJo software (TreeStar). Mice were injected i.p. with 0.5 mg anti-CD25 mAb (PC-61) or control rat IgG Abs in sterile PBS solution 3 d before and 2 d after PR8 virus infection. Organs and tissues were processed at 8 d postinfection (p.i. ), and cells were analyzed by FACS. Lungs of PC-61–treated PR8-infected mice and PR8-infected mice that had or had not received 6.5+ Tregs were isolated on day 8 p.i., perfused with 3 ml PBS, and fixed in a 4% paraformaldehyde:PBS solution. Fixed lungs were embedded in paraffin and sectioned using a Reichert-Jung 2065 rotary microtome at a width of 7 μm. Sections were stained with H&E, and samples were photographed using a Nikon E600 inverted bright-field microscope. Analysis of leukocyte-infiltrated areas of lung sections was performed using Image Pro Plus software (Media Cybernetics). RNA was isolated using the Arcturus PicoPure RNA Isolation Kit, and cDNA was synthesized with the TaqMan Gene Expression Master Mix (both from Applied Biosystems). Quantitative real-time PCR for detection of T-bet (Tbx21), IL-10, Blimp-1 (Prdm1), IL-27Rα, IFN-γ, IL-27, IRF4, GATA3, Bcl-6, and ROR-γT (Rorc) mRNA was performed with the 7500 Fast Real-Time PCR System thermal cycler and the TaqMan Gene Expression Assays with validated primers (all from Applied Biosystems). Serum samples were analyzed using the Milliplex Cytokine Bead Array Kit (Millipore), according to the manufacturer’s directions, by the Human Immunology Core at the University of Pennsylvania. Lungs were obtained from uninfected and PR8-infected mice at 3, 5, and 8 d p.i. and homogenized, and 50 μl supernatant was added in serial dilution to MDCK cells. The cells were then incubated in 0.1% BSA containing trypsin for 2 d at 37°C, and supernatant from cultures was assayed for virus based on hemagglutination. Unpaired two-tailed Student t test was performed when two independent groups within one set of samples were analyzed. The Mann–Whitney U test was performed for lung viral titers analysis for which nonparametric distribution was assumed. Comparisons between groups within the same datasets were analyzed using one-way ANOVA, followed by either the Dunnett or Bonferroni posttest for multiple comparisons. To investigate how Tregs participate in an acute influenza virus infection, BALB/c mice were infected with PR8 virus, and the representation of CD4+CD25+Foxp3+ cells in the lungs, BAL, medLNs, spleen, and nonlung-draining pLNs was determined by flow cytometry. Five days postinfection, the number of CD4+CD25+Foxp3+ cells in the medLNs had increased ∼100-fold relative to uninfected mice (Fig. 1). The numbers of CD4+CD25+Foxp3+ cells in the medLNs, lungs, and BAL were also significantly higher in infected mice than in uninfected mice at 5, 8, and 12 d p.i., although in each case there was a decline in these numbers between days 8 and 12 p.i. (Fig. 1B). There also were substantial increases in the frequencies of CD4+CD25+Foxp3− cells in the lungs and BAL of infected mice, most likely reflecting the mobilization of CD4+ effector cells to the site of infection (21, 22) (Fig. 1A). Conversely, the number of CD4+CD25+Foxp3+ cells in pLNs decreased during infection (Fig. 1B). Collectively, these data indicate that CD4+CD25+Foxp3+ T cells accumulate in the lungs, airspaces, and medLNs of PR8-infected mice. CD4+CD25+Foxp3+ Tregs localize to the sites of influenza virus infection. (A) Foxp3 versus CD25 expression by CD4+ cells obtained from the medLNs, lungs, and BAL of BALB/c mice 8 d p.i. with PR8 virus. Percentages of cells in the indicated quadrants are shown. Data are representative of at least three independent experiments (n ≥ 6). (B) Numbers of CD4+CD25+Foxp3+ cells isolated from the lungs, BAL, spleen, and pLNs, and mLNs of uninfected (Uninf) and PR8-infected BALB/c mice at 5, 8, and 12 d p.i. Bars represent mean ± SEM (n = 6–10). *p < 0.05, **p < 0.01, ***p < 0.001 versus uninfected controls, one-way ANOVA with Dunnett posttest. CD4+Foxp3+ Tregs can be generated intrathymically based on interactions between developing thymocytes and self-peptides or by conversion from conventional CD4+ T cells in response to peptide stimulation and/or cytokines, such as TGF-β (23). To determine how these different pathways contribute to Treg participation during influenza virus infection, we seeded naive BALB/c mice with either thymically generated CD4+Foxp3+ cells expressing a PR8 HA-specific TCR or with conventional CD4+Foxp3− cells expressing the same TCR and analyzed their response to PR8 virus infection. As a source of thymically derived virus-reactive Tregs we used 6.5+CD4+CD25+eGFP+ cells from TS1×HA28.Foxp3eGFP mice; these mice express the PR8 HA–specific TS1 TCR (which was obtained from a PR8-infected BALB/c mouse and can be detected with the anti-clonotypic mAb 6.5) (20), they coexpress the PR8 HA as a self-peptide (which induces the formation of thymically generated HA-specific 6.5+CD4+CD25+Foxp3+ Tregs) (7, 24), and they coexpress a Foxp3eGFP reporter allele (which allows purification of Foxp3+ cells based on eGFP expression) (25) (Fig. 2A). At 8 d p.i., >10% of the CD4+ T cells in the lungs and BAL of mice that had received virus-reactive Tregs were 6.5+eGFP+ cells, indicating that they had been derived from the donor cell population (Fig. 2B). Lower percentages of these cells were also found in the medLNs, pLNs, and spleens of infected mice, whereas no such cells were detected in the lungs of mice that had received virus-reactive Tregs but were not infected with PR8. Notably, very few of the 6.5+CD4+ cells in recipient mice were eGFP−, indicating that there was little loss of Foxp3 expression by donor-derived virus-reactive Tregs. To establish that Tregs that were generated intrathymically can respond to the viral peptide, we also transferred 6.5+CD4+CD8−eGFP+ thymocytes from TS1×HA28.Foxp3eGFP mice into BALB/c mice; at 8 d p.i., the accumulation of 6.5+CD4+eGFP+ cells in the lungs and BAL was similar to that in mice that had received 6.5+CD4+CD25+eGFP+ LN cells (Fig. 2C). Thus, Tregs expressing the TS1 TCR and that were generated in response to the HA as a self-peptide can accumulate in the lungs and medLNs of PR8-infected mice. Thymically derived virus-reactive Foxp3+ Tregs participate in anti-influenza virus immunity. (A) Experimental model. Briefly, 6.5+CD4+CD25+ eGFP+ FACS-sorted cells from TS1×HA28.Foxp3eGFP mice [termed 6.5+Foxp3(eGFP)+ Tregs] or 6.5+CD4+eGFP− cells from TS1.Foxp3eGFP mice were adoptively transferred into BALB/c mice. Mice were infected intranasally with PR8 virus, and tissues were analyzed by flow cytometry. (B) GFP(Foxp3) versus 6.5 expression by CD4+ cells isolated from the indicated tissues at 8 d p.i. with PR8 virus in BALB/c mice that had received either 6.5+Foxp3(eGFP)+ Tregs (upper panels) or 6.5+Foxp3(eGFP)− cells (lower panels). Percentages of cells in the indicated quadrants are shown. Data are representative of three separate experiments (n = 6–9). (C) Percentages of 6.5+CD4+Foxp3(eGFP)+ cells in CD4+ cells isolated from indicated tissues 8 d p.i. with PR8 virus in BALB/c mice that had received CD4+CD8−Foxp3(eGFP)+ thymocytes from 5-wk-old TS1×HA28.Foxp3(eGFP) mice. Horizontal lines indicate means (n = 3). (D) Foxp3 versus 6.5 staining of CD4+ cells from the medLNs and lungs of mice 8 d p.i. with either PR8 virus (H1N1) or J1 virus (H3N1) in BALB/c mice that had received 6.5+Foxp3(eGFP)+ Tregs. Percentages of cells in the indicated quadrants are shown. Data are representative of two independent experiments (n = 3). (E) 6.5 versus Ki-67 expression by CD4+Foxp3+ cells from the medLNs and lungs from uninfected BALB/c mice, uninfected TS1×HA28 mice, BALB/c mice 8 d p.i. with PR8 virus, and BALB/c mice, which had received 6.5+Foxp3(eGFP)+ Tregs, 8 d p.i. with PR8 virus. Percentages of cells in the indicated quadrants are shown. Data are representative of three independent experiments (n ≥ 3). (F) Foxp3 versus 6.5 expression by CD4+ cells obtained from the medLNs and lungs 8 d p.i. with PR8 virus in mice that had received 6.5+Foxp3(eGFP)+ Tregs. Cells were electronically gated into three subsets: 6.5+Foxp3+ Tregs (green boxes), “endogenous” 6.5−Foxp3+ Tregs (blue boxes), and “conventional” CD4+Foxp3− T cells (red boxes). Graphs show cell surface expression of indicated molecules by these different subsets, with colors corresponding to those of the electronically gated subsets. Figures are representative of three or more independent experiments (n = 6–10). To determine whether conventional CD4+ T cells expressing the TS1 TCR can undergo conversion to become Foxp3+ Tregs in response to influenza virus infection, we transferred 6.5+CD4+eGFP− cells from TS1.Foxp3eGFP mice into BALB/c mice and again infected the mice with PR8 virus (Fig. 2A). Infected mice that had received 6.5+CD4+eGFP− cells from TS1.Foxp3eGFP mice contained large percentages of donor-derived cells in the lungs and BAL (in this case, >50% of the CD4+ cells were donor derived), and lower percentages were found in the medLNs, pLNs, and spleens (Fig. 2B). Significantly, however, very few of the donor-derived 6.5+CD4+ cells in the infected mice were eGFP+, indicating that little or no upregulation of Foxp3 expression occurred among conventional 6.5+CD4+ T cells in PR8-infected mice. Altogether, these results demonstrate that Tregs that were generated intrathymically in response to a self-peptide can accumulate in the lungs and medLNs in response to influenza virus infection. By contrast, conventional CD4+ T cells with identical specificity for the viral Ag undergo little or no conversion into CD4+Foxp3+ Tregs. To assess whether Tregs were accumulating in the lungs and medLNs as a result of specific recognition of the HA viral Ag or, more generally, in response to inflammatory signals, we transferred 6.5+CD4+Foxp3+ Tregs into BALB/c mice and infected the recipient mice with either PR8 virus or with a reassortant virus (J1) containing an antigenically distinct H3 subtype HA molecule that lacks the S1 peptide recognized by the 6.5 TCR (19). Unlike mice that were infected with PR8, there was no accumulation of 6.5+CD4+Foxp3+ T cells in the medLNs, lungs, or BAL of J1-infected mice 8 d p.i. (Fig. 2D). 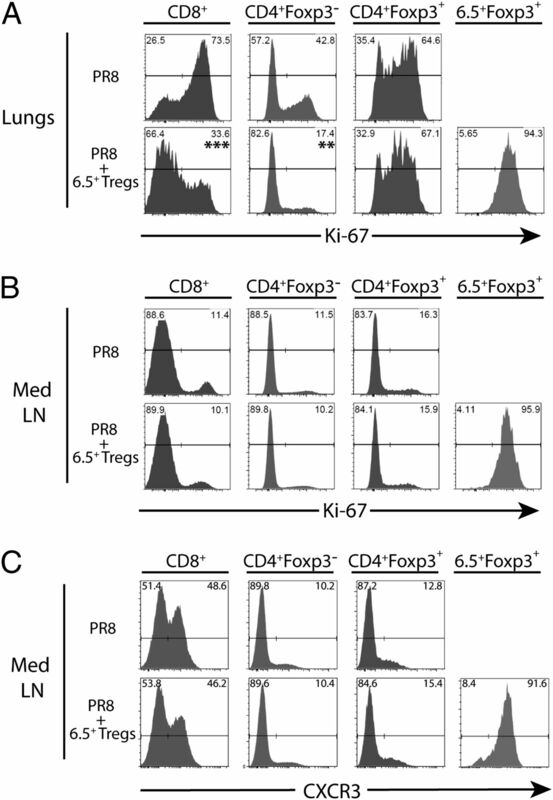 To determine whether 6.5+CD4+Foxp3+ Tregs actively proliferate in response to PR8 infection, we examined levels of the cellular division marker protein Ki-67. 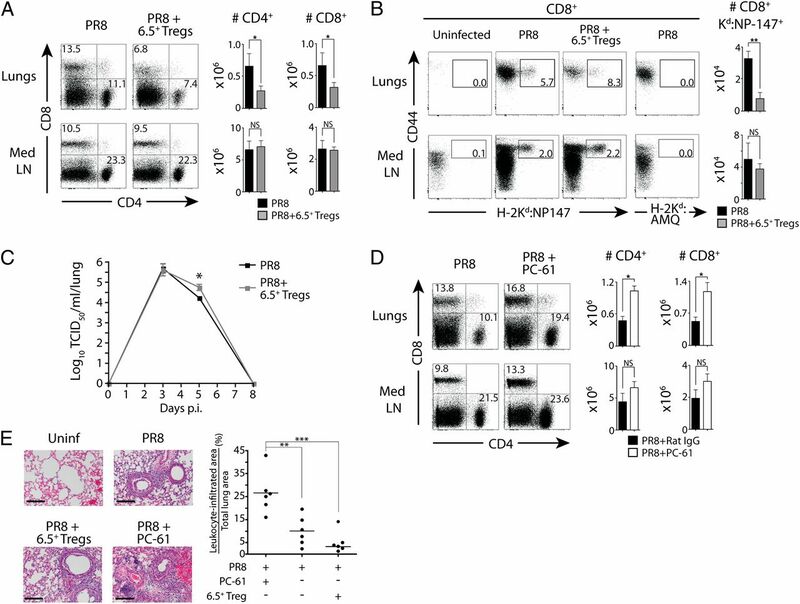 More than one quarter of the CD4+Foxp3+ cells in the medLNs and more than one half of CD4+Foxp3+ cells in the lungs of PR8-infected BALB/c mice were Ki-67+ (Fig. 2E). Moreover, in mice that had received 6.5+CD4+Foxp3+ T cells from TS1×HA28 mice, the large majority of 6.5+ cells in the medLNs and roughly one half of those in the lungs were Ki-67+. This increase in Treg division reflected activation by the viral Ag, because only a small fraction of the 6.5+CD4+Foxp3+ T cells isolated from the lungs of uninfected donor TS1×HA28 mice were Ki-67+ (Fig. 2E). 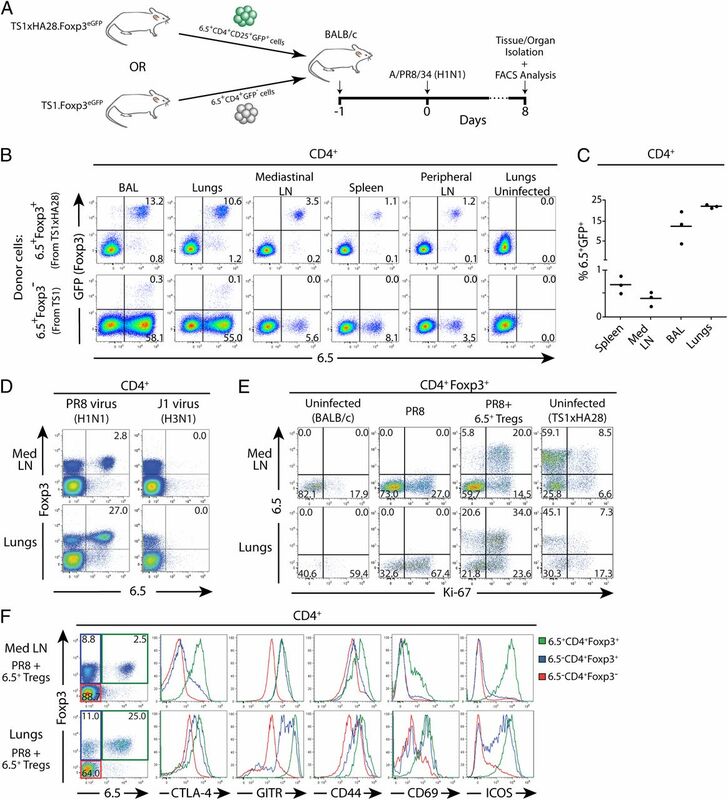 The virus-reactive 6.5+ Tregs localizing to the lungs and medLNs also exhibited higher levels of expression of CTLA-4, GITR, CD44, CD69, and ICOS than did “conventional” CD4+Foxp3− T cells in both the medLNs and the lungs, and these higher expression levels were again reflective of activation by viral Ag because they were also elevated relative to input 6.5+CD4+Foxp3+ cells from TS1×HA28 mice (Supplemental Fig. 1). The non–6.5-expressing endogenous CD4+Foxp3+ cells in the lungs and medLNs also included cells expressing higher levels of these molecules than were expressed by CD4+Foxp3− “conventional” CD4+ T cells, although only a subset of the cells expressed levels equivalent to those expressed by 6.5+CD4+Foxp3+ T cells, and, for CD69 and ICOS, upregulation occurred predominantly in the lungs (Fig. 2F). Collectively, these data demonstrate that thymically derived virus-reactive Tregs can accumulate, proliferate, and acquire activation-associated phenotypes in the medLNs and lungs of influenza-infected mice in response to the recognition of viral peptide. To understand how virus-reactive Tregs can modulate the immune response to influenza virus infection, we analyzed the accumulation of effector CD4+ and CD8+ T cells in the lungs and medLNs of mice that had or had not received Tregs from TS1×HA28 mice. The introduction of Tregs from TS1×HA28 mice led to significant decreases in the numbers of CD4+ and CD8+ T cells in the lungs of infected mice, although notably, accumulation in the medLNs was not affected (Fig. 3A). The frequencies and numbers of viral Ag-specific CD8+ T cells detected with a H2-Kd:NP147+ tetramer were similarly decreased in the lungs but not in the medLNs (Fig. 3B). The decreased accumulation of effector CD4+ and CD8+ T cells had an apparent effect on virus replication, because virus titers in the lungs were significantly increased at 5 d p.i. in the presence of virus-reactive Tregs, although virus titers at days 3 and 8 were unaffected (Fig. 3C). Virus-reactive Tregs downmodulate the accumulation of effector T cells in the lungs of influenza-infected mice. (A) CD4 versus CD8 expression in the lungs and medLNs at day 8 p.i. of PR8-infected BALB/c mice that had or had not received 6.5+Foxp3(eGFP)+ Tregs. Numbers indicate mean percentages. Bar graphs represent cell numbers, with bars representing mean ± SEM (n ≥ 3). Data are representative of at least three independent experiments. *p < 0.05. (B) CD44 versus H2-Kd:NP147 expression by CD8+ cells in the lungs, BAL, and medLNs 8 d p.i. of PR8-infected BALB/c mice that had or had not received 6.5+Foxp3(eGFP)+ Tregs. Also shown is CD44 versus H2-Kd:AMQ expression on cells from PR8-infected mice (staining control). Numbers indicate mean percentages. Bar graphs represent cell numbers, with bars representing mean ± SEM (n ≥ 3). Data are representative of at least three independent experiments. **p < 0.03. (C) Viral titer kinetics in the lungs of PR8-infected BALB/c mice that had or had not received 6.5+Foxp3(eGFP)+ cells. Data are mean ± SEM per time point analyzed (n = 3–6). Data are representative of two independent experiments. *p < 0.05. (D) CD4 versus CD8 expression in the lungs and medLNs 8 d p.i. of PR8-infected BALB/c mice that were or were not treated with anti-CD25 mAb (PC-61). Numbers indicate mean percentages. Bar graphs represent cell numbers, with bars representing mean ± SEM (n ≥ 3). Data are representative of at least two independent experiments. *p < 0.05. (E) Representative H&E-stained lung sections of uninfected and PR8-infected mice that received 6.5+Foxp3(eGFP)+ Tregs, PC-61, and/or virus. Scale bars, 200 μm. Graph shows percentages of leukocyte-infiltrated areas over total lung area for the three conditions indicated, as determined by morphometric analysis of sections obtained from entire lung lobes. Each symbol represents a mouse. Data are representative of two independent experiments. **p < 0.01, ***p < 0.001, one-way ANOVA with Bonferroni posttest. We also analyzed the effect of depleting Tregs on the numbers of CD4+ and CD8+ T cells that accumulated in the lungs of infected mice. Treatment of BALB/c mice with the anti-CD25 mAb PC-61 resulted in a decreased frequency of CD4+Foxp3+ cells (Supplemental Fig. 2), and this reduction in Tregs was accompanied by a significantly higher accumulation of effector CD4+ and CD8+ T cells in the lungs and a modest (but not significant) increase in these cells in the medLNs of infected mice (Fig. 3D). Depletion of CD4+Foxp3+ cells also led to a significant increase in inflammatory processes involving bronchioles and alveoli in the lungs of infected mice, whereas the presence of adoptively transferred virus-reactive Tregs reduced the accumulation of inflammatory leukocytes at these sites (Fig. 3E). Together, these data show that virus-reactive Tregs can control the number of effector cells at the infected site during influenza virus infection. Moreover, because increasing the frequency of virus-reactive Tregs could suppress the accumulation of effector T cells, whereas depleting Tregs exerted the opposite effect, these data strongly suggest that the immune repertoires of otherwise unmanipulated BALB/c mice contain Tregs that, like the Tregs from TS1×HA28 mice, can limit the recruitment of effector CD4+ and CD8+ T cells to the lungs of virus-infected mice. IL-10 was shown to be an important cytokine for the activity of Tregs at environmental interfaces, such as the lung (26). Likewise, IL-10 was shown to be crucial to counter an excessive proinflammatory response during influenza infection (27). Therefore, we examined the ability of the adoptively transferred 6.5+CD4+Foxp3+ cells and endogenous 6.5−CD4+Foxp3+, CD4+Foxp3−, and CD8+ cells to produce IL-10 and/or IFN-γ in PR8-infected mice. Although very little or no cytokine production was detected in CD4+ or CD8+ T cells from the lungs of uninfected mice (data not shown), >25% of the CD4+Foxp3− cells, >35% of the CD4+Foxp3+ cells, and >20% of the CD8+ cells from lungs of PR8-infected BALB/c mice 8 d p.i. with PR8 virus could secrete either one or both of these cytokines (Fig. 4A, upper panels). Notably, the majority of the 6.5+CD4+Foxp3+ cells accumulating in the lungs became IL-10-producers, and, in the presence of these IL-10–secreting virus-reactive Tregs, there were significant reductions in the numbers of CD4+Foxp3− and CD8+ effector T cells that produced either IFN-γ alone or both IFN-γ and IL-10 (Fig. 4A, lower panels). Similarly, although the percentages of IL-10+CD4+Foxp3− and IL-10+CD4+Foxp3+ cells increased, their total cell number was reduced in the lungs of mice that had received 6.5+CD4+Foxp3+ cells. The 6.5−CD4+Foxp3+ cells in the lungs of PR8-infected mice that had not received Tregs from TS1×HA28 mice also secreted IL-10; although the percentage that secreted IL-10 increased slightly in the presence of 6.5+CD4+Foxp3+ T cells, their number decreased, likely due to displacement by the transferred Tregs (Fig. 4A). Virus-reactive Tregs produce IL-10 preferentially in the lungs and suppress CD4+ and CD8+ effector T cells. (A) IL-10 versus IFN-γ staining of indicated T cell subsets from the lungs 8 d p.i. of PR8-infected BALB/c mice that had or had not received 6.5+Foxp3(eGFP)+ Tregs. Numbers represent mean percentage of cytokine-producing cells (n = 3). Bar graphs show the numbers of cells of each phenotype; bars represent mean ± SEM (n = 3). Data are representative of four independent experiments. **p < 0.03, ***p < 0.01. (B) Same as in (A), but for medLNs. **p < 0.03, ***p < 0.01. (C) Cytokine levels in serum of uninfected BALB/c mice and 8 d p.i. of PR8-infected mice that did or did not receive 6.5+Foxp3(eGFP)+ Tregs. Bars represent mean ± SEM (n = 6–10). *p < 0.05, **p < 0.03, ***p < 0.01. Despite the large increase in the frequency of IL-10–secreting 6.5+CD4+Foxp3+ cells in the lungs, there was little or no IL-10 secretion by 6.5+CD4+Foxp3+ cells isolated from the medLNs of infected mice that had received Tregs. There also was very little IL-10 production by either endogenous 6.5−CD4+Foxp3+ Tregs or by CD4+Foxp3− effector T cells in the medLNs of infected mice, irrespective of whether they had received Tregs from TS1×HA28 mice. However, both CD4+Foxp3− and CD8+ effector cells from the medLNs could secrete IFN-γ, and the numbers of these cells were significantly lower in the medLNs of mice that had received Tregs (Fig. 4B). The levels of a variety of serum cytokines, including IFN-γ, were also significantly lower, whereas levels of IL-10 were significantly higher, in the serum of PR8-infected mice that had received Tregs from TS1×HA28 mice (Fig. 4C). 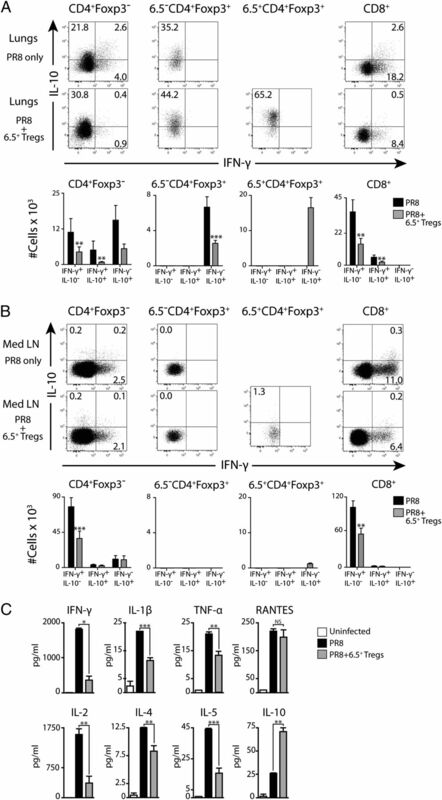 Altogether, these data indicate that thymically derived Tregs can become IL-10 competent by responding to a viral Ag in PR8-infected mice and that the presence of a high frequency of these cells can lead to decreased frequencies of IFN-γ–secreting CD4+ and CD8+ effector cells in the lungs and medLNs, in addition to altering the systemic cytokine response to virus infection. Tregs were shown to be able to adopt transcriptional and functional programs that confer specificity to their ability to regulate effector T cells responses (12). Indeed, the ability to secrete IL-10 and suppress IFN-γ production is a hallmark of T-bet+ Tregs; therefore, we examined whether the virus-reactive Tregs in PR8-infected mice had acquired this transcriptional program. 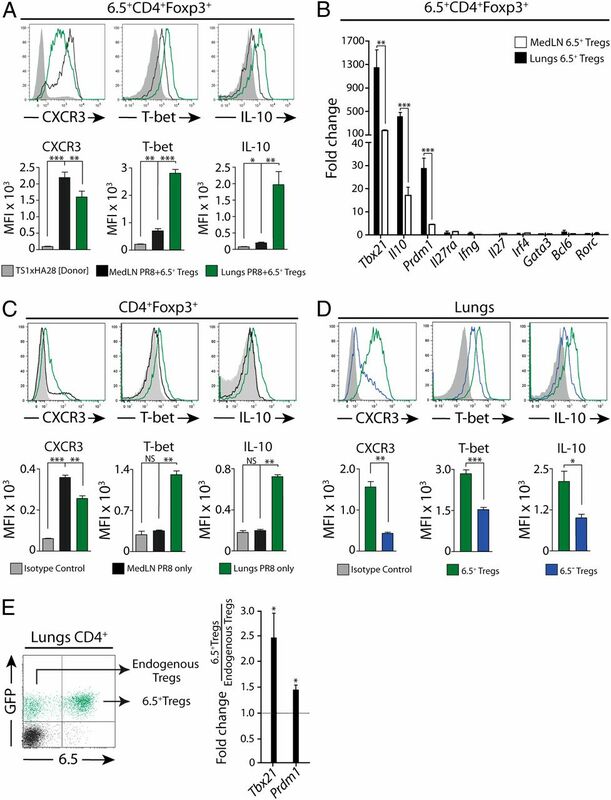 6.5+CD4+Foxp3+ cells isolated from the lungs of infected mice expressed high levels of CXCR3 and T-bet, in addition to IL-10, indicative of their differentiation into T-bet+ Tregs (Fig. 5A). Interestingly, although the levels of IL-10 and T-bet in 6.5+CD4+Foxp3+ cells in the medLNs of infected mice were significantly upregulated relative to those found in donor 6.5+CD4+Foxp3+ cells from TS1×HA28 mice, in each case they were significantly lower than in 6.5+CD4+Foxp3+ cells isolated from the lungs of infected mice. In contrast, CXCR3 levels were highest in 6.5+CD4+Foxp3+ cells isolated from the medLNs of infected mice; although lower levels were found in 6.5+CD4+Foxp3+ cells isolated from the lungs, CXCR3 nevertheless was clearly upregulated in both lungs and medLNs relative to cells obtained from donor TS1×HA28 mice (Fig. 5A). Virus-reactive Tregs acquire a T-bet+ Treg transcriptional program with IL-10 production in the lungs of influenza-infected mice. (A) CXCR3, T-bet, and IL-10 levels in 6.5+CD4+Foxp3+ cells obtained either from the lungs (green lines) or medLNs (black lines) at 8 d p.i. of PR8-infected BALB/c mice that had received 6.5+Foxp3(eGFP)+ Tregs or from uninfected TS1×HA28 donor mice (gray lines). Bar graphs show mean fluorescence intensity (MFI) of each population. Bars represent mean ± SEM (n ≥ 3), Data are representative of four independent experiments. *p < 0.05, **p < 0.03, ***p < 0.01. (B) Real-time quantitative RT-PCR analysis of mRNA levels in 6.5+Foxp3(eGFP)+ cells that had been FACS purified from lungs or medLNs at d 8 p.i. of PR8-infected BALB/c mice that had received 6.5+Foxp3(eGFP)+ Tregs. Data are shown relative to expression levels in 6.5+Foxp3(eGFP)+ Tregs purified from donor TS1×HA28 mice using the ΔΔCT quantitative method (41). All samples were normalized to Gapdh expression levels; bars represent mean ± SEM (n = 3). **p < 0.03, ***p < 0.01. (C) As for (A), but for polyclonal CD4+Foxp3+ cells from PR8 virus–infected mice that did not receive 6.5+Foxp3(eGFP)+ Tregs. In this case, levels are shown relative to an isotype control. **p < 0.03 and ***p <0.01. (D) As for (A), except for 6.5+CD4+Foxp3+ (green lines) versus 6.5−CD4+Foxp3(eGFP)+ (blue lines) cells from lungs. Data are representative of three independent experiments (n ≥ 3). Bars represent mean ± SEM. Levels are shown relative to an isotype control. *p < 0.05, **p < 0.03, ***p < 0.01. (E) Electronic gating used to purify 6.5+Foxp3(eGFP)+ cells (“6.5+ Tregs”) and 6.5−Foxp3(eGFP)+ cells (“Endogenous Tregs”) from lungs of PR8-infected BALB/c.Foxp3eGFP mice that had received 6.5+Foxp3(eGFP)+ Tregs. Bar graph shows relative expression of Tbx21 and Prdm1 mRNAs determined by real-time quantitative PCR (n = 3). Bars represent mean ± SEM. *p < 0.05, one-way ANOVA with Bonferroni posttest or unpaired Student t test analyses for multiple or dual comparison of groups. To more closely evaluate the differential expression of IL-10 and T-bet in the lungs versus the medLNs of infected mice, we purified 6.5+CD4+eGFP+ cells from these sites by FACS and determined the levels of IL-10 and T-bet (Tbx21) mRNA relative to the input 6.5+CD4+eGFP+ cells from TS1×HA28 mice. Notably, the levels of IL-10 and T-bet transcripts that were found in 6.5+CD4+eGFP+ cells analyzed directly ex vivo closely paralleled the amounts detected by intracellular cytokine staining following stimulation with PMA and ionomycin: IL-10 and T-bet mRNA levels were highest in 6.5+ Tregs isolated from the lungs of infected mice and, although lower than in the lungs, the levels found in Tregs from the medLNs were higher than those found in the input 6.5+ Tregs from TS1×HA28 mice (Fig. 5B). Interestingly, mRNA levels for the transcription factor Blimp-1 (Prdm1) showed a similar pattern of expression, with highest levels in 6.5+ Tregs obtained from the lungs and a slight increase relative to input in cells from the medLNs (Fig. 5B). This is noteworthy because Blimp-1 previously was implicated in the acquisition of IL-10 secretion by both Tregs and CD8+ T cells (28, 29); in contrast, mRNAs encoding other molecules that previously were implicated in processes associated with Th1 cell (IFN-γ, IL-27, IL-27R-α), Th2 cell (IRF4 and GATA3), Th17 cell (ROR-γt), and follicular Th cell (Bcl-6) conversion of Tregs were not differentially expressed in these different 6.5+ Treg populations (16, 17, 30, 31) (Fig. 5B). To establish whether T-bet+ Treg specialization can occur in the Tregs of mice that had not received an extraneous source of Tregs, we examined CD4+Foxp3+ cells from the lungs and medLNs of mice that had been infected with PR8 virus but had not received Tregs from TS1×HA28 mice. In this case, CD4+Foxp3+ cells in both the lungs and the medLNs showed significant upregulation of CXCR3 (Fig. 5C). The levels of IL-10 and T-bet were also significantly higher than isotype controls in CD4+Foxp3+ cells from the lungs but not the medLNs (Fig. 5C). Finally, to determine whether TCR specificity contributes to T-bet+ Treg specialization, we compared 6.5+CD4+Foxp3+ cells with endogenous 6.5−CD4+Foxp3+ cells in the lungs of mice that had received Tregs from TS1×HA28 mice. The 6.5+CD4+Foxp3+ cells expressed significantly higher levels of CXCR3, T-bet, and IL-10 than did endogenous 6.5−CD4+Foxp3+ cells (Fig. 5D). We also purified 6.5+CD4+eGFP+ and 6.5−CD4+eGFP+ cells from the lungs of infected BALB/c.Foxp3eGFP mice that had been seeded with Tregs from TS1×HA28.Foxp3eGFP mice and found significantly higher levels of both T-bet and Blimp-1 mRNAs in the GFP+ cells expressing the clonotypic 6.5 TCR compared with endogenous Tregs (Fig. 5E). Altogether, these data indicate that virus-reactive Tregs undergo differentiation to acquire distinct T-bet+ Treg phenotypes in the lungs and medLNs of infected mice. In addition, within cells that were present in the lungs of infected mice, the levels of IL-10, T-bet, and Blimp-1 were highest in Tregs expressing a TCR that confers strong reactivity toward the viral Ag. To examine how T-bet+ Tregs were leading to decreased numbers of effector T cells in the lungs of infected mice, we analyzed cell division using the proliferation marker Ki-67. Sizable fractions (from 60 to 80%) of the CD8+ and CD4+Foxp3− effector cells in the lungs of infected mice that had not received Tregs were Ki-67+, consistent with previous studies showing that effector cells undergo active proliferation in the lungs of influenza virus–infected mice (27, 32) (Fig. 6A). Notably, the percentages of CD8+ and CD4+Foxp3− cells that were Ki-67+ were significantly reduced in the lungs of mice that had received Tregs from TS1×HA28 mice. It was also noteworthy that most of the Foxp3+ Tregs (both the 6.5+CD4+Foxp3+ cells derived from TS1×HA28 mice and the endogenous 6.5−CD4+Foxp3+ cells) in the lungs were Ki-67+ and that the presence of Tregs from TS1×HA28 mice did not lead to decreases in Ki-67 expression by the endogenous Tregs, in contrast to their effects on CD8+ and CD4+Foxp3− effector cells (Fig. 6A). Virus-reactive T-bet+ Tregs suppress proliferation of effector T cells in the lungs of infected mice. (A) Ki-67 expression by indicated T cell subsets isolated from the lungs and medLNs 8 d p.i. of PR8-infected BALB/c mice that had or had not received 6.5+Foxp3(eGFP)+ Tregs. Numbers indicate mean percentages (n ≥ 3). Data are representative of at least three independent experiments. (B) Same as (A), but for medLNs. (C) CXCR3 expression by indicated T cell subsets isolated from the medLNs 8 d p.i. of PR8-infected BALB/c mice that had or had not received 6.5+Foxp3(eGFP)+ Tregs. Numbers indicate mean percentages (n ≥ 3). Data are representative of at least three independent experiments. **p < 0.03, ***p < 0.01, unpaired Student t test. Contrary to the abundant Ki-67 expression that was evident in the lungs of infected mice, smaller percentages (∼10%) of the CD8+ and CD4+ T cells in the medLNs of infected mice were Ki-67+ (Fig. 6B). Moreover, there was no difference in the percentage of Ki-67+ cells in the medLNs of mice that had or had not received virus-reactive Tregs. There were also no differences in the expression of CXCR3 by CD4+ and CD8+ T cells in the medLNs; because CXCR3 plays a major role in directing the migration of T cells from the medLNs to the lungs during respiratory infection (33), this argues against the possibility that Tregs affect the accumulation of effector cells in the lungs by blocking their migration from the medLNs (34) (Fig. 6C). Instead, virus-reactive T-bet+ Tregs prevent the accumulation of effector T cells primarily by suppressing their proliferation at the site of infection. We showed in this study that Tregs that were generated intrathymically based on specificity for a self-peptide can undergo functional specialization during the course of an immune response to influenza virus infection. Virus-reactive T-bet+ Tregs isolated from the medLNs and lungs of PR8-infected mice in each case expressed elevated levels of CXCR3, along with additional molecules associated with Treg function and/or activation, such as CTLA-4, CD44, and ICOS. The levels of T-bet and IL-10 expressed by 6.5+CD4+Foxp3+ cells were also elevated in cells isolated from both the lungs and the medLNs compared with those found in cells analyzed directly after isolation from these tissues in TS1×HA28 mice, consistent with differentiation into T-bet+ Tregs. Interestingly, however, the 6.5+ T-bet+ Tregs cells isolated from the lungs of infected mice expressed significantly higher levels of T-bet, Blimp-1, and IL-10 than did cells from the medLNs, providing evidence that Tregs with identical antigenic specificity can differentiate into phenotypically distinct subsets of T-bet+ Tregs at different anatomical locations in an infected host. The signals that induce functional specialization of Tregs in different settings are still being defined. T-bet+ Tregs were first identified based on the ability of Foxp3+ T cells to upregulate T-bet in response to IFN-γ, which, in turn, promoted CXCR3 expression and was accompanied by increased IL-10 production (15). More recently, Foxp3+ T cells expressing Blimp-1 were found to be highly represented in the lungs of Blimp-1–reporter mice (29). T-bet was also found to be expressed in these cells but was dispensable for IL-10 production; instead, Blimp-1, acting in concert with IRF-4, was required for these cells to produce IL-10. Our studies provide evidence that TCR signaling can also be important in determining the amount of IL-10 that is expressed, because T-bet, Blimp-1, and IL-10 levels were all significantly higher in Tregs expressing the clonotypic 6.5 TCR than in the endogenous (6.5−) Tregs in the lungs of infected mice. This disparity must be due to differences in TCR signaling, because the 6.5+ and 6.5− Tregs had been isolated from infected lungs simultaneously and, thus, had been exposed to the same cytokine environment. In support of this conclusion, Blimp-1 mRNA was shown to increase substantially in Tregs in response to TCR stimulation (35), and T-bet expression by effector CD4+ T cells is also sensitive to TCR stimulation (14). Because the levels of Blimp-1 and T-bet in lung Tregs also correlated with the amount of IL-10 that is produced, the data further suggest that the differing levels of Blimp-1 and/or T-bet that are induced in response to TCR stimulation can determine the amount of IL-10 that differentiated Tregs produce. In contrast, Irf4 levels did not differ between the input Foxp3+ Tregs and those isolated from infected mice, suggesting that its expression levels do not play a role in modulating the extent of IL-10 production by Tregs. Several mechanisms might account for the significant differences in Blimp-1, T-bet, and IL-10 expression that were found between T-bet+ Tregs isolated from the lungs and the medLNs of infected mice. One possibility is that these phenotypes arise progressively: for example, if virus-reactive Tregs are initially activated in the medLNs where they upregulate T-bet, Blimp-1, and CXCR3, they produce low levels of IL-10 and they then migrate to the lungs and undergo further differentiation. Consistent with this possibility, CD4+Foxp3+ T cells accumulated most rapidly in the medLNs at 5 d p.i. (increasing ∼100-fold in the medLNs relative to uninfected mice versus 4-fold in the lungs), whereas they did not reach peak numbers in the lungs until 8 d p.i. Another mechanism, which is not mutually exclusive, is that differing levels of cytokines and/or specialized cell types support Treg differentiation into cells that express high versus low amounts of IL-10 in the lungs versus the medLNs. For example, neutrophil-derived IL-27 acting in concert with IL-2 was shown to induce IL-10 production in CD8+ T cells in the lungs of influenza virus–infected mice by a Blimp-1–dependent mechanism (28), and differences in the local availability of these or other cytokines might contribute to the different levels of Blimp-1, T-bet, and IL-10 that we found among 6.5+T-bet+ Tregs isolated from these two sites. Lastly, the extent of differentiation might be linked to the degree of proliferation of the Tregs. Previous studies indicated that proliferation by lung-resident CD8+ T cells makes a substantial contribution to the overall immune response during influenza virus infection (32). It is possible that proliferation of Tregs in the lungs induces more extensive Treg differentiation, leading to the accumulation of virus-reactive T-bet+ Tregs with significantly different phenotypes in the lungs and the medLNs under steady-state conditions during influenza virus infection. The distinct phenotypes displayed by 6.5+CD4+Foxp3+ cells in the lungs and medLNs are also notable in light of differences in the effects of Treg activity on effector CD4+ and CD8+ cells at these different sites. There were significant reductions in the numbers of IFN-γ–secreting CD4+Foxp3− and CD8+ T cells in both the lungs and the medLNs of PR8-infected mice that had received 6.5+ Tregs from TS1×HA28 mice. However, although the presence of 6.5+ Tregs inhibited proliferation and accumulation of IFN-γ–secreting CD4+ and CD8+ cells in the lungs, proliferation and accumulation appeared to be little affected in the medLNs. Because a prominent difference between the Foxp3+ Tregs that accumulate at these sites is the amount of IL-10 that they can produce, the suppression of effector CD4+ and CD8+ T cell proliferation in the lungs may be mediated by high local concentrations of IL-10 that are produced by Blimp-1hi T-bethi IL-10hi Tregs and that may act either directly on T cells themselves or by modifying local APC activity. In support of this possibility, IL-10 expression by Tregs was shown previously to be required to prevent spontaneous inflammatory responses at mucosal sites (including the lungs), but it did not appear to be required to prevent systemic immune activation in sites such as LNs (26). In addition, IL-10R blockade resulted in lethal pulmonary inflammation during influenza infection, consistent with a role for IL-10 in controlling inflammatory responses in the lungs of infected mice (27). In contrast, the Tregs in the medLNs produced little or no IL-10, and it is possible that these Tregs could inhibit cytokine production, but not the proliferation of effector T cells, by an alternative mechanism. For example, CTLA-4 expression by Tregs may be more important in regulating the immune responses that develop in the medLNs versus the lung, consistent with studies indicating that mice whose Tregs lack CTLA-4 expression develop excessive effector T cell responses systemically (i.e., in sites such as LNs) but not in the tissues (36). Whatever the basis, the present studies are significant because they contrast and extend previous studies indicating that Tregs modify the immune response to pathogens primarily by controlling the homing of effector T cells from the draining LNs to the infected site (37); we showed that Tregs can exert regulatory effects primarily through their ability to suppress the differentiation and proliferation of CD4+ and CD8+ effector T cells in the infected tissues themselves. The findings point to a prominent role for thymically derived Tregs in modulating the immune response to an infectious agent, whereas conventional CD4+ T cells with identical specificity for the pathogen underwent little or no conversion to become “adaptive” Tregs in influenza virus–infected mice. CD4+Foxp3+ T cells expressing a pathogen-specific transgenic TCR were similarly found to expand in response to Mycobacterium tuberculosis, whereas conventional CD4+ T cells with the same specificity underwent little or no conversion to become Foxp3+ Tregs (11). It was notable that depletion of Tregs using anti-CD25 treatment induced reciprocal effects; this implies that the immune repertoire of otherwise unmanipulated mice contains Tregs that exert similar effects on the immune response as we observed in mice with increased Treg frequencies. In addition, the finding that anti-CD25 treatment led to enhanced, rather than diminished, effector T cell responses in the lungs implies that this treatment primarily was removing a regulatory component (because a direct effect of anti-CD25 treatment on effector cells would most likely have caused a reduced, rather than increased, effector T cell response). Lastly, it is interesting to consider whether the high frequencies of virus-reactive Tregs that are present in the adoptive-transfer setting that we used in this study might also arise in the setting of natural influenza virus infections. It is unclear whether the T-bet+ Tregs generated during an infection can adopt long-lived “memory” phenotypes; if so, then virus-reactive Tregs would be present at increased frequencies when an individual is reinfected with a pathogen bearing a cross-reactive Ag, creating a similar situation to the one that we generated experimentally in this study using an adoptive-transfer approach. It also will be important in future experiments to determine whether self-peptide–selected Tregs can become activated by viral Ags with which they are only weakly cross-reactive, as we demonstrated previously based on in vitro suppression assays (38). Antiviral CD8+ T cell responses were shown to be modified by prior infections with cross-reactive Ag as the result of perturbations of the available immune repertoire (39). For influenza infection, it is possible that virus-reactive T-bet+ Tregs can be expanded by repeated exposure to cross-reactive viral epitopes over an individual’s lifetime and contribute to the decreased immune responsiveness that is found in aged individuals (40). We thank Krystyna Mozdzanowska, the Wistar Flow Cytometry Core, and the University of Pennsylvania Human Immunology Core for technical expertise. This work was supported by National Institutes of Health Grants AI083022 and AI51966, National Cancer Institute Grant P30 CA10815, and the Commonwealth of Pennsylvania. F.B. was supported by National Cancer Institute Training Grant CA09171 and G.-S.C. was supported by National Institutes of Health Training Grant HL07748. 2011. Biological functions of regulatory T cells. Adv. Immunol. 112: 137–176.
. 2009. Regulatory T cells in the control of host-microorganism interactions (*). Annu. Rev. Immunol. 27: 551–589.
. 2008. Role of endogenous and induced regulatory T cells during infections. J. Clin. Immunol. 28: 707–715.
. 2012. Selection of regulatory T cells in the thymus. Nat. Rev. Immunol. 12: 157–167.
. 2001. Thymic selection of CD4+CD25+ regulatory T cells induced by an agonist self-peptide. Nat. Immunol. 2: 301–306.
. 2011. Phenotypical and functional specialization of FOXP3+ regulatory T cells. Nat. Rev. Immunol. 11: 119–130.
. 2003. Antigen-driven effector CD8 T cell function regulated by T-bet. Proc. Natl. Acad. Sci. USA 100: 15818–15823.
. 2000. A novel transcription factor, T-bet, directs Th1 lineage commitment. Cell 100: 655–669.
. 1976. Mapping of the influenza virus genome: identification of the hemagglutinin and the neuraminidase genes. Proc. Natl. Acad. Sci. USA 73: 2142–2146.
. 1994. Thymic selection of CD8+ single positive cells with a class II major histocompatibility complex-restricted receptor. J. Exp. Med. 180: 25–34. 2011. Induction and function of virus-specific CD4+ T cell responses. Virology 411: 216–228.
. 2004. CD4+ CD25+ regulatory T cell repertoire formation in response to varying expression of a neo-self-antigen. J. Immunol. 173: 236–244.
. 2007. Regulatory T cells dynamically control the primary immune response to foreign antigen. J. Immunol. 178: 2961–2972.
. 2008. Regulatory T cell-derived interleukin-10 limits inflammation at environmental interfaces. Immunity 28: 546–558.
. 2011. The transcription factors Blimp-1 and IRF4 jointly control the differentiation and function of effector regulatory T cells. Nat. Immunol. 12: 304–311.
. 2009. Cutting edge: contribution of lung-resident T cell proliferation to the overall magnitude of the antigen-specific CD8 T cell response in the lungs following murine influenza virus infection. J. Immunol. 183: 4177–4181.
. 2009. CXCR3 directs antigen-specific effector CD4+ T cell migration to the lung during parainfluenza virus infection. J. Immunol. 183: 4378–4384.
. 2011. T cell responses during influenza infection: getting and keeping control. Trends Immunol. 32: 225–231.
. 1995. Lymphoproliferative disorders with early lethality in mice deficient in Ctla-4. Science 270: 985–988.
. 2008. CD4+CD25+ regulatory T cell repertoire formation shaped by differential presentation of peptides from a self-antigen. J. Immunol. 180: 2149–2157.
. 2005. The effect of age on the cognate function of CD4+ T cells. Immunol. Rev. 205: 220–228.